August 2015 – Damn, I Can Make That! My husband and I like to think we’re pretty easy going when it comes to pizza, but the truth its, we’re not. At all. He likes meat-y, cheesy, greasy pizza. Where I want something more light and refreshing – yes, a pizza can be refreshing, guys (see ingredients below). So, I decided to solve this problem by making us each our own batch of dough to top with whatever we please. (It’s like we’re 5 years old again and need our OWN batter or we don’t want it at all.) If you’re in the same boat or just want a small pizza to nosh on, this one’s for you. No sharing required. In a mixing bowl with the dough attachment, combine 1 1/2 cups of the flour, the salt and the yeast. Add the warm water and canola oil. (If you don’t have a dough attachment, you can use the flat beater or the whisk.) Beat the ingredients on low for 30 seconds until fully combined, then gradually add in the remaining flour. Beat on medium-high until a dough begins to form. (If you have a dough attachment you can skip this next part.) Turn the dough out on to a lightly floured surface and knead until smooth and elastic. On a cookie sheet, divide the dough in half (one for you, one for your significant other…) cover, and let sit for 10 minutes to rise. At this point, if you want to store the dough for later use, spray two ziplock bags with cooking oil and place the dough inside each. You can freeze the dough up to 3 months. If you’re ready to use right away, preheat your oven to 400 degrees. On your floured surface, roll the dough out to roughly 1/2 inch high for thin crust, or 1 inch high for regular. Brush on the olive oil and truffle oil, leaving space along the edge for the crust. Layer on the mozzarella and parmesan cheese. (If you don’t have a pizza pan like me, but want to keep the round shape, flip over a cookie sheet and bake the pizza on top of it.) Bake for 15 to 20 minutes until the crust is golden and the cheese is melted. A couple of minutes before pulling it out of the oven top it with the arugula. When it’s completely done squeeze the fresh lemon (sans lemon seeds) over the whole thing. Sit back and enjoy the fact that you can have it aaalll to yourself. Ok, guys. 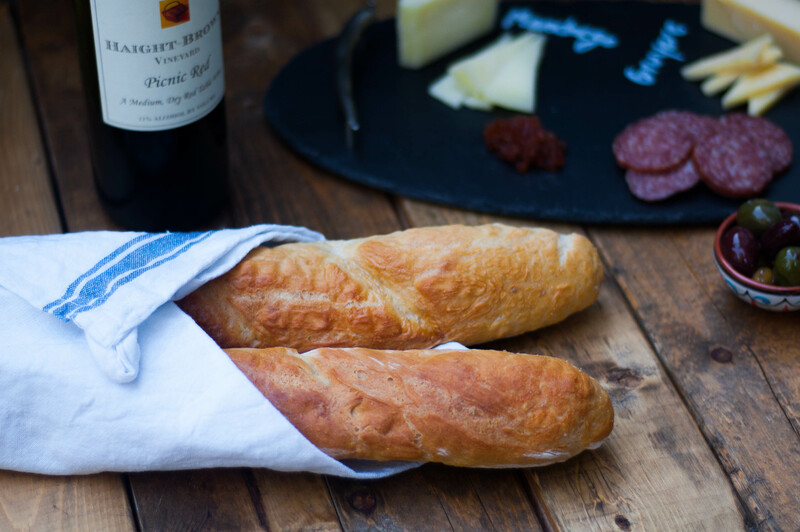 It’s high time we start taking it up a notch by making our own bread, a baguette to be exact. I can’t tell you how helpful this has been when throwing parties. Make a quick baguette (you don’t have to wait hours for this one to rise. It takes roughly an hour for prep and baking), bake it and cut it up. You can use the recipes we gave you for crostini, or toast, or go crazy with your own toppings! Whatever your heart desires. Sayonara store bought bread. Preheat the oven to 170 degrees, and grease a cookie sheet or baguette pan. Using a greased knife, cut the dough in half and roll it out into a log/baguette. 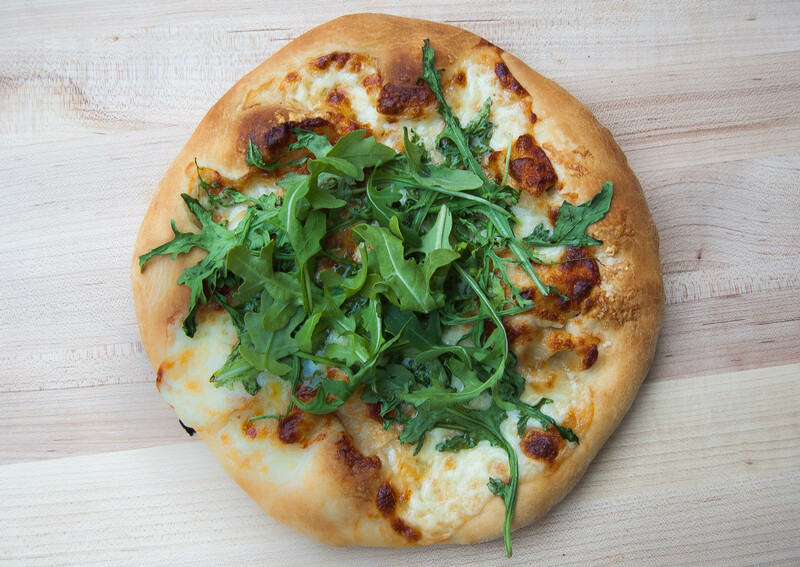 **If you want a crispy crust, whisk the egg white and brush on top of the dough. Place the dough on the sheet or pan, and make 3 small, even slits across the top of each baguette. Bake for 15 minutes. Leaving the dough in the oven, turn it up to 400 degrees for another 15 minutes. Then turn the oven down to 350 for another 10 minutes. Galettes are the hot item right now, and why wouldn’t they be? They’re so ridiculously easy! One pie crust? Some fruit? Done. Guys, when I say it’s easy it’s no joke. I made this after work, just before a neighbor’s BBQ last Tuesday night. I made it again on Friday. It’s that good. Ok, I get that it’s hot and you don’t want to use your oven. But we promise, it’s worth it. 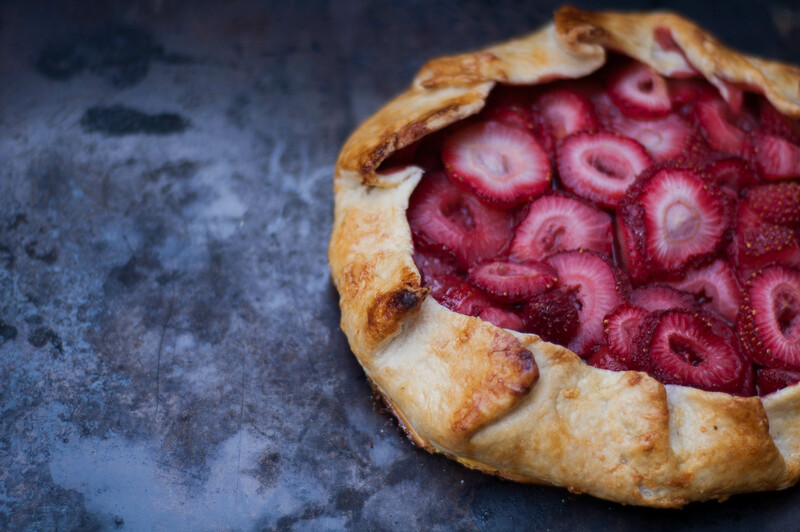 You already have a recipe for an apple galette to use up your fall apples, now it’s time to use all of those fresh summer strawberries. No pie plate? No problem. Hint: If you see recipes for crostatas, they’re actually the same as galettes. Crostasas = Italian and Galettes = French. Take your pick! Preheat the oven to 400 degrees and line a cookie sheet with parchment paper (or this reusable mat. Mix together the almonds, sugar, and flour. Lay the pie crust flat on the cookie sheet and sprinkle the almond mixture on top, leaving roughly 2 inches free along the edge. Place the strawberries on top and begin to fold up the edges, creasing where needed. Mix together the egg yolk and water and brush along the crust. Sprinkle sugar all along the top. Bake for 30 minutes. You can serve the galette hot or cold. Just when you think chocolate couldn’t get any better, Lindsay from Life, Love, and Sugar adds Baileys to it and totally blows us away. 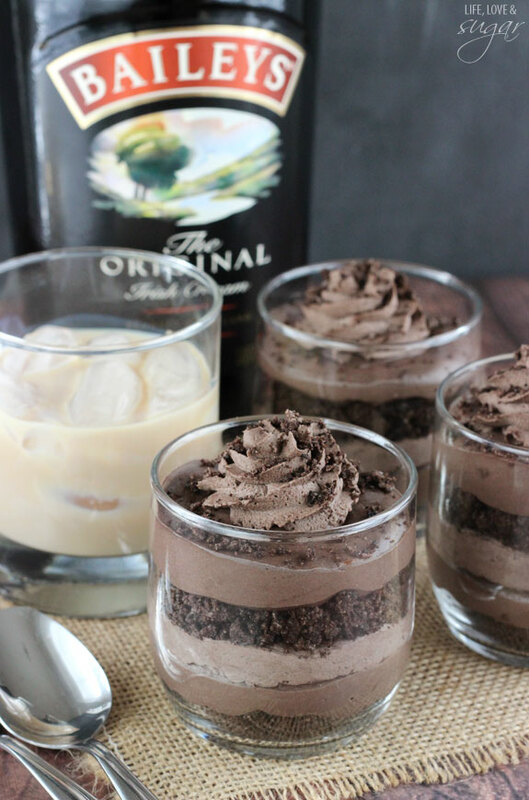 She has a recipe for the perfect bite size chocolate trifles (think: P.F. Changs’ mini desserts). Plus, it has cheesecake and Oreos. #Drooling. I made a test batch of these bad boys and it was like eating a dream. I dare you to try them as well! Beat the cream cheese, sugar and cocoa together in a bowl until smooth. Add Baileys and mix until well incorporated. Set aside. In another bowl, whip heavy whipping cream until it starts to thicken. Add Baileys, cocoa and powdered sugar and continue to whip until stiff peaks form. (This is where I left out the Baileys). To make the trifles, divide half of the cookie crumbs evenly between the four cups (or jars) and spread into an even layer in the bottom of the cups. Pipe or spoon, an even layer of cheesecake filling on top of the cookie crumbs in each of the four cups. You should only use about half of the filling. Pipe, or spoon, an even layer of whipped cream on top of the cheesecake filling in each of the four cups. Divide remaining cookie crumbs between the four cups and evenly distribute the second layer of crumbs on top of the whipped cream. You can keep a little bit of crumbs aside, if you want to use them to sprinkle on top of the finished trifles. Pipe, or spoon, remaining cheesecake filling on top of cookie crumbs, distributing evenly between the four cups. Top each trifle with a swirl of whipped cream and a few more cookie crumbs, if you kept some aside. Refrigerate until ready to serve. Lindsay recommends setting them out for about 15 minutes prior to eating, so that they aren’t too firm. It’s peach season people. And what better way to eat peaches than with another summer favorite – strawberries! (Ok, we think our peaches and cream and peach cobbler recipes are pretty awesome too. FINE, we’re obsessed with peaches.) Aaanyway, I picked these juicy fruits up from our local farmers’ market over the weekend. I absolutely adore going to farmers’ markets and I’m lucky enough to say I have a handful of them all within 15 minutes away. The fact that I can get fresh fruits and veggies means endless recipe options, for us and you. Saweet! And if you go a little overboard with too many fruits and veggies, before they start turning, throw them in to muffins like these little guys. 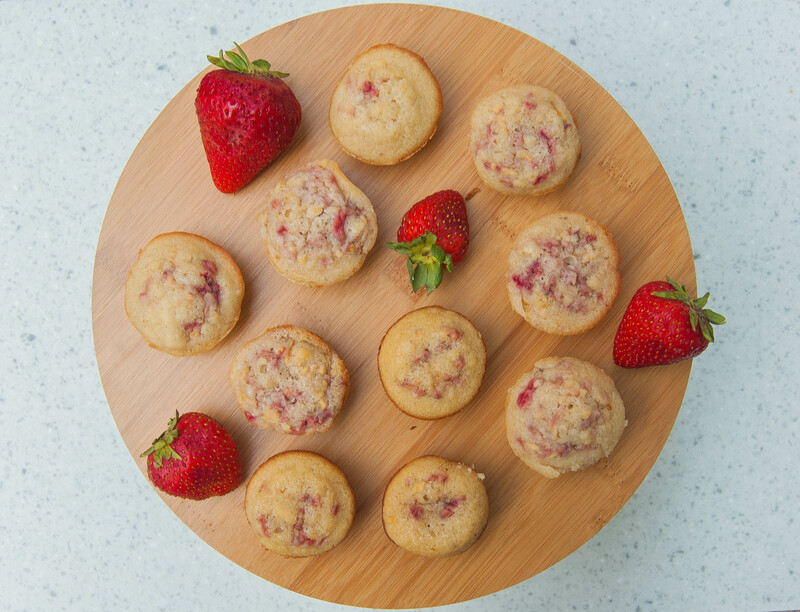 These mini muffins are perfect for brunch or as dessert. And, warning: they’re super poppable. You may run out sooner than you think. Preheat the oven to 350 degrees and grease a mini muffin pan. In a mixing bowl, combine the dry ingredients: baking powder, flour, and sugar until fully blended. Stir in the eggs, both extracts, and the butter. You should begin to see a dough form. When fully combined, gently fold in the strawberries and peaches. Pour into the pan, filling each muffin to 3/4 high. Bake for 20 minutes or until the tops are golden brown.